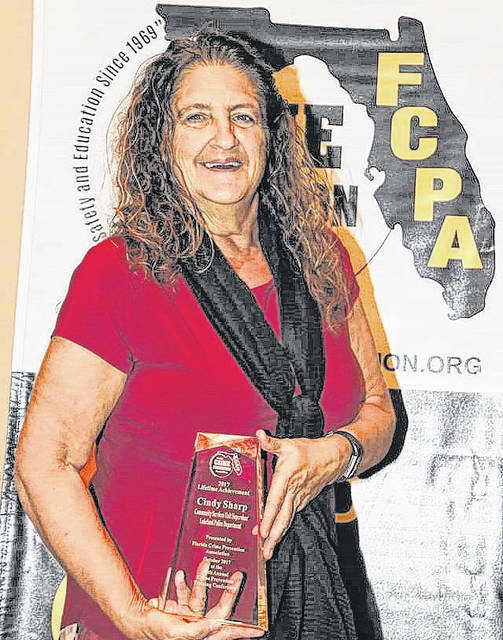 LAKELAND, Florida — Former Galion resident Cindy McClenathan Sharp was honored recently by the Florida Crime Association with its 2017 Lifetime Achievement Award. A 1978 Galion High School, graduate, Sharp is the supervisor of the Community Services Unit with the Lakeland Police Department. She has been with the police department for 21 years. She is the daughter of Galion’s Dale McClenathan, who worked for 30 years at the Galion Water Department. He was a city council member after he retired. He was city council president at the time of his death. His death — in a way — led to Cindy’s career with the law enforcement. The 48th annual awards ceremony for the Florida Crime Prevention Association was in October. The Lifetime Achievement Award is presented to an individual who has dedicated the majority of their career to to crime prevention efforts. Sharp moved to Lakeland 21½ years ago, and got involved with the police department six months after she arrived. She’s been doing her part — and doing it very well — ever since. The rest is history, and the Lakeland area is better off for Cindy McClenathan’s efforts efforts. This year the department she supervises was named the Department of the Year within the Lakeland Police Department. In 2009, sharp was selected as Lakeland Police Department’s Civilian of the Year, and in January 2014 promoted to her current position of Community Services Unit Supervisor. She also has served as president and vice president of the Polk County (Florida) Community Traffic Safety Team from 2000 to 2004. She was vice president of the Suncoast Crime Prevention Association that serves all law enforcement agencies in an eight-county area in the Tampa Bay Region from 2009-2011. She was elected the Suncoast Crime Prevention Association President in 2012 and in 2015 was elected as the Region III Director for Florida Design Out Crime Association (FLDOCA).